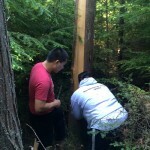 CedarPulling6-27-14A from Brandi Montreuil on Vimeo. 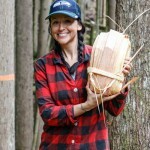 Tulalip tribal member Chelsea Craig separates the inner bark from the outer bark on a strip of red cedar she harvested during an annual cedar harvesting event organized by Tulalip Forestry on June 27-28. 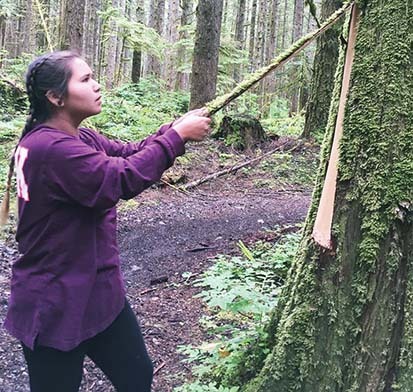 Leaning over a long strip of red cedar placed on her lap, Tulalip tribal member Cerissa “Pipud” Gobin, asked her 4-year-old daughter, Emmy “Pipud” Ramsey, if she knew what was in the center of the cedar tree. “What is in the center of you? That is right; it is your heart. 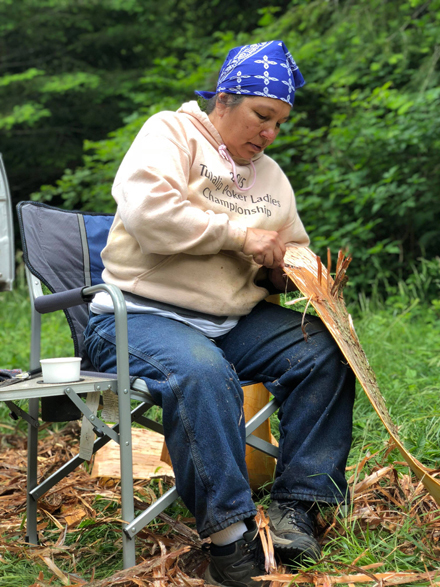 So in the center of the cedar tree is a heart,” said Gobin, as she continued her methodical rhythm of peeling inner bark from the outer bark on a strip of cedar that was recently cut from a nearby group of trees. 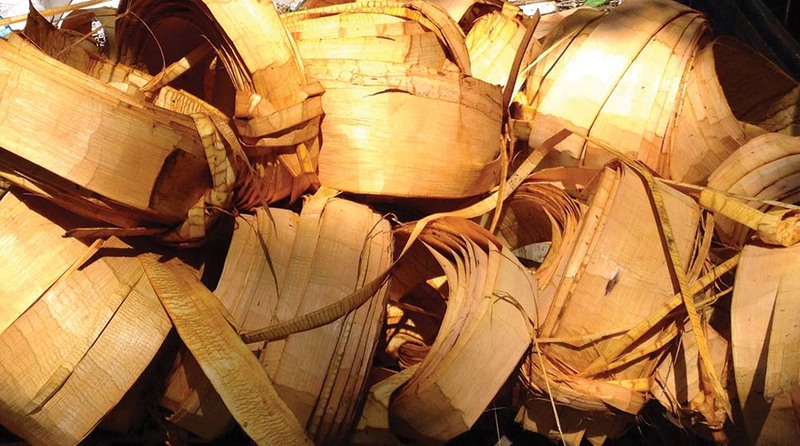 “When I first started pulling I had no idea what I was doing,” said Gobin. “I learned as I went along. 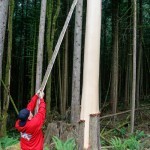 I learned to get the little pieces of bark left on the inside off before you leave, otherwise you are going to spend a lot of time trying to get it off later,” she continued, occasionally looking up from the long strip on her lap to watch her son, Coen, pull another strip of bark off a tall red cedar. 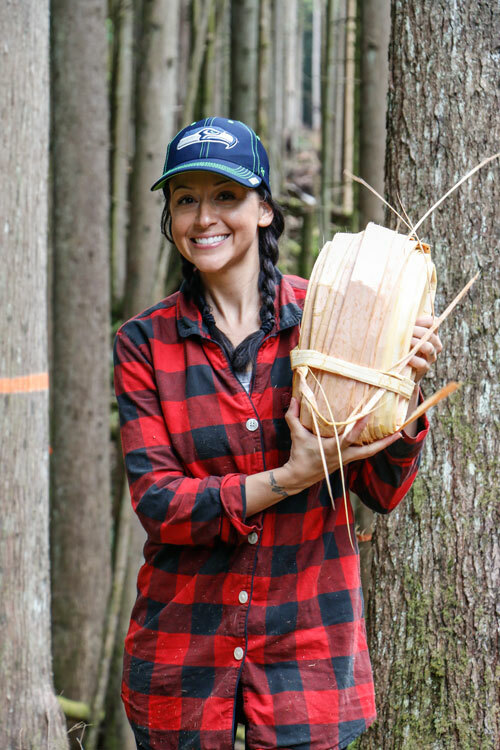 Clustered around Gobin and her sister, Chelsea Craig, also a Tulalip tribal member, were long strips of cedar waiting to have their inner bark stripped, which will be used to make cultural items. 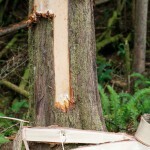 Outer bark is left for the forest to reclaim. 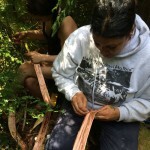 Both women are educators who plan to use the cedar for in-class projects next year. Gobin, a high school art educator at Heritage High School, uses the cedar to teach students how to make traditional headbands or bracelets, some of which are later used during graduation ceremonies. 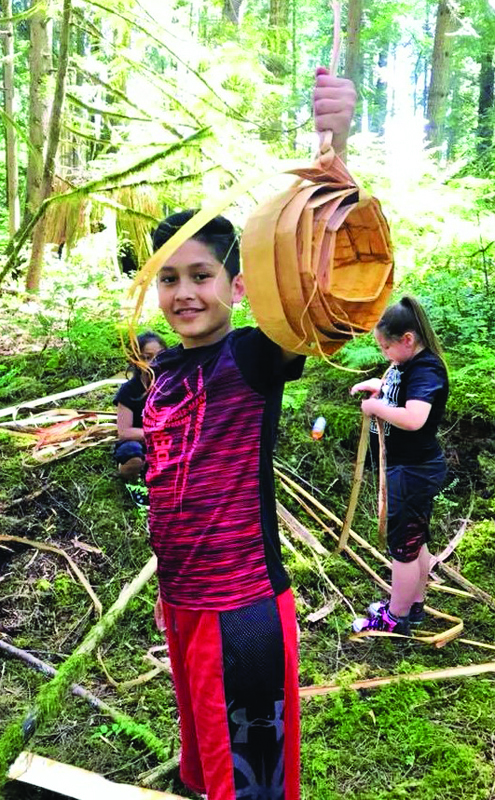 Craig, a teacher at Quil Ceda & Tulalip Elementary, uses the cedar to teach youth to make baskets, hats, and pins for potlatch giveaways. 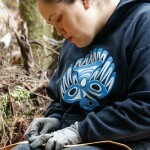 Although they teach students how to weave different items, together they weave a cultural foundation for Tulalip youth. 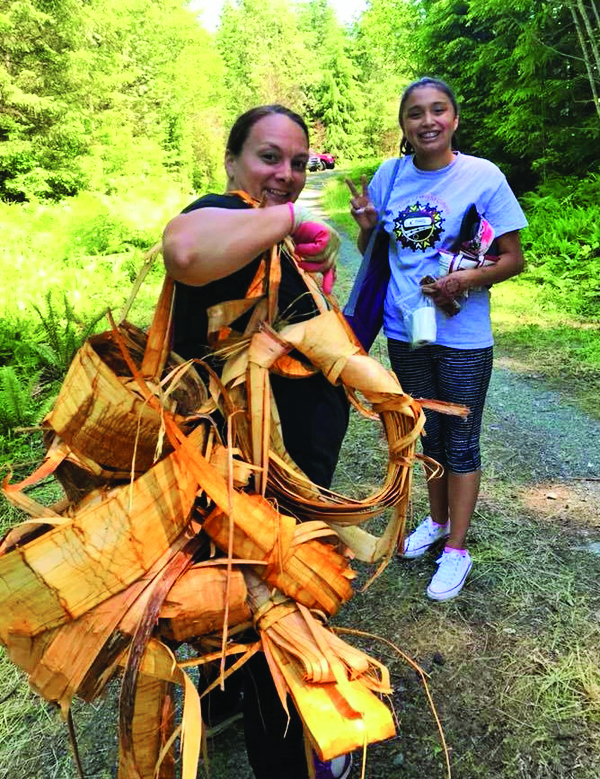 Cerissa ‘Pipud’ Gobin harvested nearly 3 dozen bundles of cedar during the harvesting event organized by Tulalip Forestry on June 27-28. Department on June 27-28. 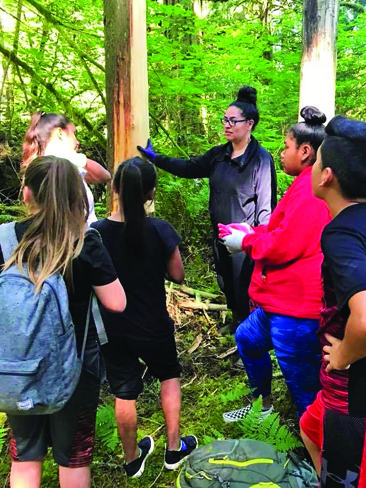 The event, and others like it, is made possible by a growing partnership between the Tulalip Tribes and the Washington State Department of Natural Resources. 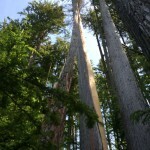 The land is owned by DNR, with Sierra Pacific owning the timber. 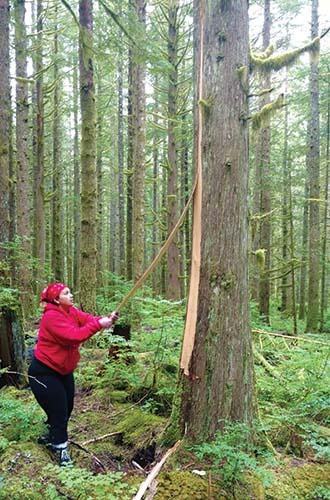 Department of Natural Resources notifies Tulalip Forestry when an area is scheduled to be cleared. 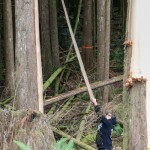 This season, 83 acres were available for harvesting cedar. 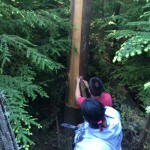 Many Tulalip youth participated in the two-day cedar-harvesting event, gathering strips for elders and learning techniques of separating the smooth inner bark from the rough outer bark. 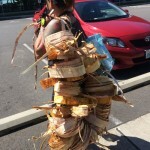 For many, this was their first trip gathering cedar. “Yes, grandpa would be proud of us,” remarked Craig. 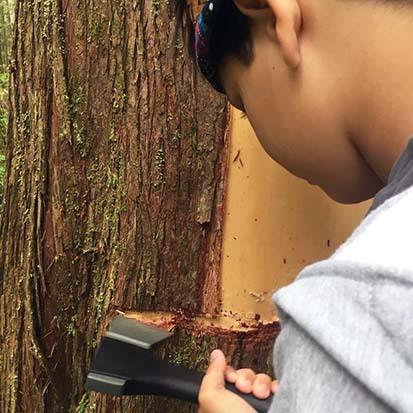 For more information regarding future cedar harvesting events, please contact Tulalip Forestry at 360-716-4000. 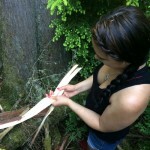 Lushootseed teachers braved the 70 degree weather this afternoon to harvest cedar for traditional community use. 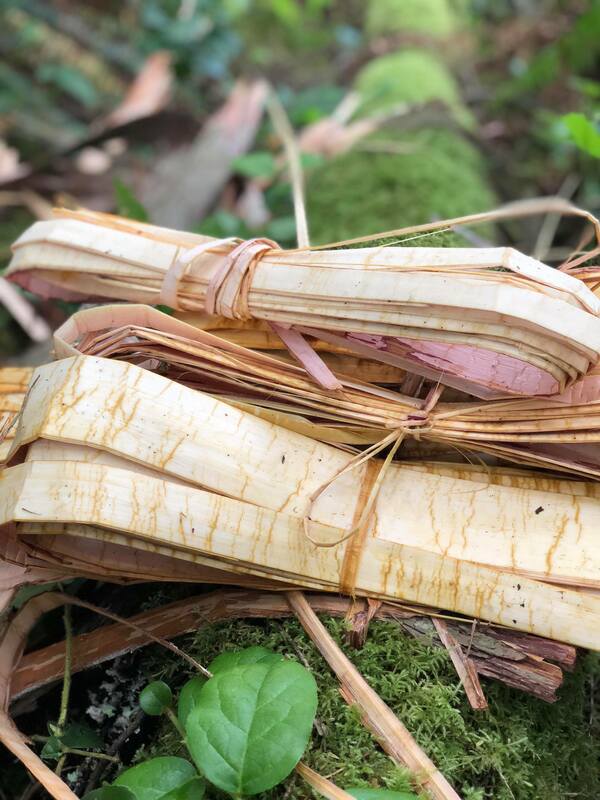 Collaborating with Tulalip Natural Resources, the teachers were able to gather enough cedar bundles to continue providing cedar roses for use in funerals. 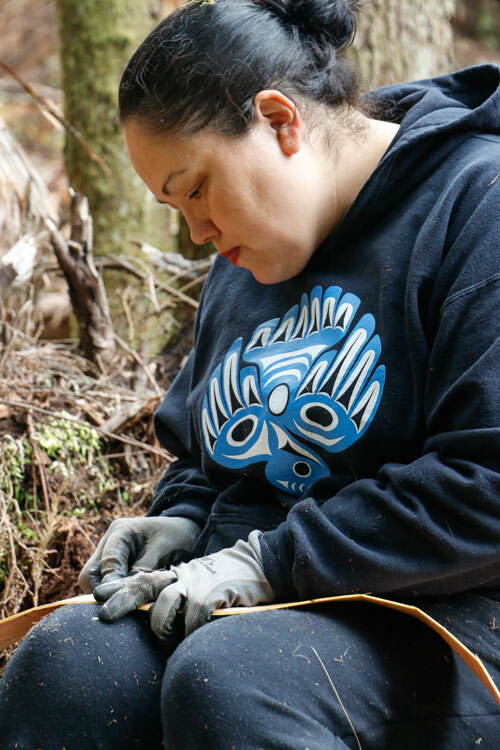 The Lushootseed Department provides 150 roses per funeral service and make them traditionally by hand with good hearts and minds, and receive no profit made for this service. 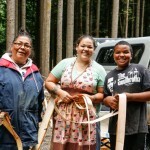 Rocky Renecker, with Tulalip Funeral Services, also harvested cedar on behalf of the funeral services team. 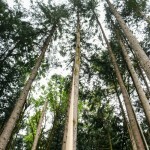 Dupoint says the cedar gathered from the area has a unique scent, different from any other cedar in the United States and Canada. 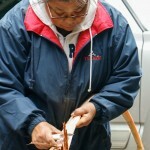 He said medicine people in the Kiowa Tribe would also leave spiritual power for future generations on the mountain. The mountain being in jeopardy can be traced back to the creation of the Kiowa, Comanche and Apache Reservation through the Medicine Lodge Treaty of 1867, which placed the tribes’ reservation in southwest Oklahoma, where Longhorn Mountain is. By 1901, the Jerome Agreement opened the Kiowa, Comanche and Apache Reservation to non-Indian settelement, after the KCA familes were allotted 160 acres each. Sections of the mountain were alloted to Kiowa families, but those lands were eventually sold to non-Indians—five non-Indian familes currently own the Longhorn Mountain area. It is through what Dupoint refers to as a “gentleman’s agreement” that the Kiowa have entered the mountain on the east side to gather cedar. Mining is scheduled to begin on the west side of the mountain this summer. 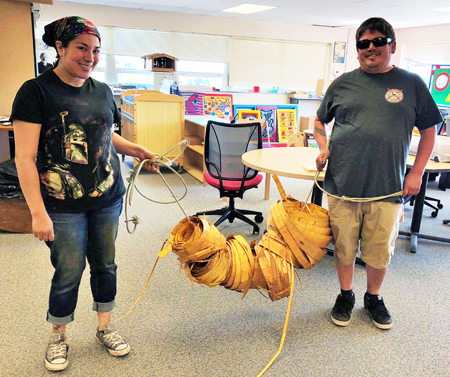 A blasting permit was issued by the Oklahoma Department of Mines to the Material Service Corporation, according to Amie Tah-Bone, the Kiowa Museum director. Rock crushing activities will then be under the supervision of Stewart Stone, based out of Cushing, Oklahoma. Calls placed to the Oklahoma Department of Mines and to Stone have not been returned. 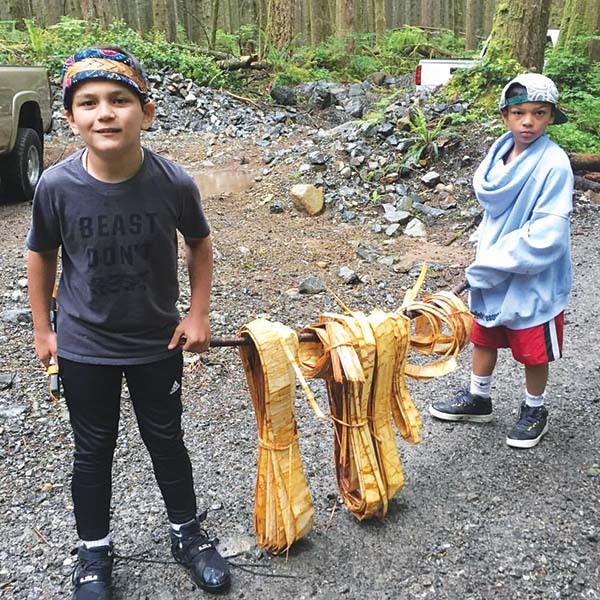 Dust from the mining activities on the west side have the potential to impact the area’s environment, ranging from reduction of air quality, damage to surrounding crops and livestock, and killing of the cedar trees on the mountain. The Kiowa have been meeting with landowners as well as state and federal officials about the issue. Kiowa officials have also been meeting with the farmers and ranchers in the surrounding region about the environmental impact of the mining. Dupoint and Tah-Bone encourage those who want to help to contact the Kiowa Tribe at 580-654-2300 or email pr@kiowatribe.org. Previous attempts to purchase the land have not been successful. 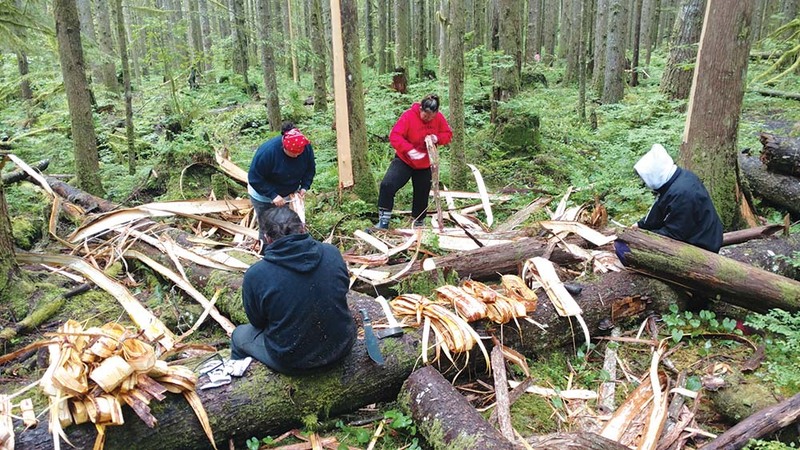 For now, efforts to halt construction rest with those who hold the surface and mineral rights to the mountain—the landowners—and those who are spiritually connected to the mountain.